Q. My 15-year-old son just got a Veiled Chameleon from the pet shop. They suggested that he keep this animal's food in the house. I am really worried that these crickets and mealworms are going to get out and ruin our home furnishings. Can you give us any ideas on how to keep the insects outside or if it's possible to train the chameleon to eat dead or frozen insects? A. Crickets and Mealworms do have the potential to be household pests, however if contained properly they really aren't much of a threat. Crickets and mealworms need warmth around 75-85 degrees F (24-29C) to be happy and healthy. Mealworms can be kept in the refrigerator for a couple of weeks if need be but must be warmed to be fed to your son's chameleon. Keeping the worms inactive in the fridge is a poor way to keep them, however! The best way to maintain Mealworms is to keep them in a smooth sided container such as a plastic bin that they cannot escape from. Feed the worms on a good quality gut-loading food such as the one manufactured by Walkabout Farm as well as vegetables such as carrots or sweet potatoes. You should keep your crickets in a container that has slick sides such as a deep plastic bin. The bins are easy to find at any mass retailer such as Walmart or Target. Crickets should be provided with a place to hide such as paper egg crating (this is the crating used to cushion eggs). Be careful when removing the insects for feeding; the occasional escapee shouldn't be much of a problem if you're quick to catch it. They can also be trapped using glue boards or other devices such as roach hotels etc. Usually, after escaping, crickets will die in a very short time and are not much bother. Mealworms are not generally regarded as household pests other then occasionally infesting grain products but usually the Indian Mealmoth is more to blame in this regard than are mealworms. I would definitely not recommend keeping your feeder insects outside. This will usually lead to rapid die off due to temperature highs and lows, humidity problems as well as possible pest insects invading the feeder insects containers such as ants, wasps, and other pests. There are too many variables outside that can go wrong. Although I am sure defrosted insects might be utilized to feed some lizards, this is far more trouble then it's worth. Chameleons are attracted by the living insects movement, which stimulates them to feed. Your family will enjoy your son's animal far more by observing its natural feeding behavior on living insects. I can't imagine trying to entice a chameleon to eat a defrosted cricket. It's just not something the chameleon will want to do. When do I breed them? Q. I recently bought a pair of Panther Chameleons from a breeder. They are three months old and I was told I could breed them when they are five months old. I am new to breeding my chameleons, but this seems pretty young to me. Can you tell me what is the proper breeding age and what I should do once I have the eggs? A. You're right in asking the question in advance of the event. Once you have eggs laid it's too late to find out what to do or not to do! Many people often wait until the last moment, or even after they are laid, to figure out what they should have done! Many things govern when an animal, especially a lizard, is ready to reproduce. Probably the first rule rule is how physically mature is the animal in question? If the animal is fully grown then yes, it could be bred at an earlier age. 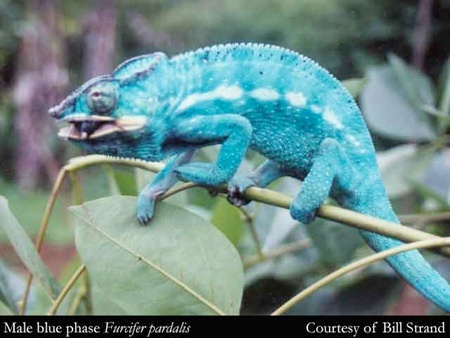 Personally, I have never seen a fully grown adult Panther Chameleon at five months and would venture to guess that more like 9 months to a year is the norm for a well grown animal to reach sexual maturity. I am sure there are many animals that, even at a year, are not ready to reproduce because of the way they were raised. Stunted specimens should never be bred. With that being said, I have to admit I have seen animals that were imported, and although it was impossible to determine their ages, it was pretty obvious that fully gravid females were half the size of animals we consider fully grown in captivity. The question of course will come to mind "Does this hurt the female?" I don't think, from my experience, it's good for her! Let's say she did breed, lay eggs and that the eggs are the proper shape, size, and have good calcification. You will need to consider the type of incubation according to which species has laid them. In the case of Panther Chameleons, we currently believe a shallow plastic container with a tightly sealed lid is one of the very best incubation chambers for your eggs to be in during incubation. Damp squeezed incubation medium such as peatmoss, vermiculite or, what I prefer, is the coconut husk product used for planting mixes for orchids, ferns and also sold for reptile litter by some companies. The eggs should be buried about halfway to two thirds in the medium and should be placed on their sides. 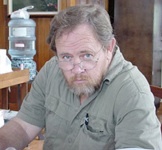 The top half of the eggs that protrude above the medium should be far enough below the container's lid so that the condensation does not collect on them. The plastic container should be placed in an area with a fairly static temperature such as a closet or other area that will maintain itself between 70-78 degrees Fahrenheit (20-24C). If the temps dip below this for a short time it doesn't seem to hurt things but you should aim for this temperature gradient. Higher temperatures seem to kill developing embryos much easier than do lower temperatures as long as they don't go too low. Frequent observations of the eggs should be done to make sure they are progressing. Always remove any sunken, discolored or obviously bad eggs over the course of the incubation period. Incubation time for Paradalis eggs should be fall between 7 and 12 months, with some clutches of eggs having all the eggs hatch within a 24 hr period and other clutches, hatching over an extended period of time. I have given you a basic quick curriculum here. There are many nuances that you should be prepared for and things don't always go as you might hope. I believe we are planning a whole article in an upcoming issue that will deal with incubation and problems you might encounter. You'll need to study up on neonatal care after hatching it's a whole subject in itself! Q. My female Four-Horned Chameleon (Chamaeleo quadricornis) just laid 8 eggs for me! She is a wild caught animal and I assume came in gravid. How should I incubate the eggs? A. Four-Horned Chameleons are animals that come from cool, very humid mountains in West Africa. Taking this as your clue you should set your eggs up in a shallow plastic container with a tightly sealed lid and plenty of damp peatmoss mixed with fifty percent fine sand or, in my opinion, the best incubation medium is ground Coconut Husk that has been soaked in water and then squeezed so it's moderately damp. The temperature should be maintained in the higher 60's to low 70's Fahrenheit (20-21C) and should not go much above 72F (22C). Keep the container in a static air area such as a household closet where temperatures do not change much. You can poke some very tiny holes with a pin in the top for air exchange but don't get too carried away and always check to make sure the humidity is high inside the egg chamber but the medium should not be soggy. 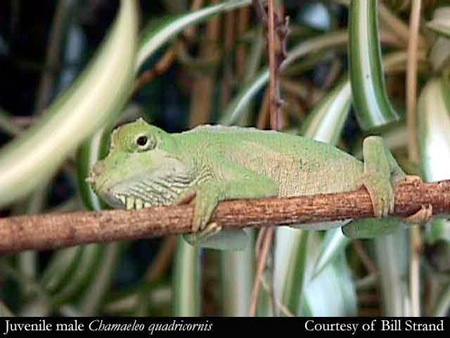 Incubation for Four-Horned Chameleons is usually around 4 to 6 months. Q. My Panther Chameleon seems tired of eating crickets! He doesn't get as excited as he used to when I offer him crickets. What else should I feed him? Are mealworms good food? A. Chameleons are like many other higher life form - they do get tired of the same old food item all the time. Variety is the spice of life even for a chameleon! Some animals, especially captive bred, will habituate to one or a couple of feeder insects and not want anything else but most do like a variety. Usually this means collecting wild insects in your neighborhood or seeking out alternative suppliers of odd and unusual insects such as grasshoppers, pill bugs, earthworms, snails, mantids, moths, stick insects, katydids etc. Always try to collect insects away from sprayed and heavy agricultural growing areas to avoid herbicides and insecticides. Another consideration is to make sure the insects that you are able to feed are well loaded with lots of nutrients in their intestines. This is called gut loading. Gut loading is a great way to boost the nutritional value of any insect offered to your chameleon. 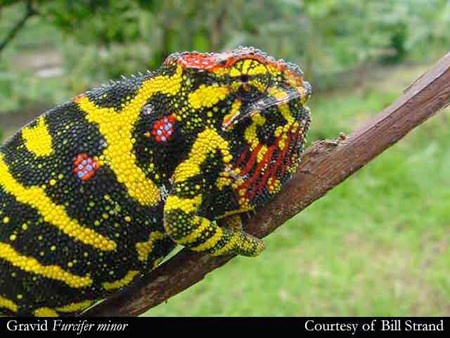 Often, just changing the food items that your insects eat will restore the appetite of a chameleon. I favor plant-based nutrition for most feeder insects. Crickets, Giant Mealworms (Zophobas) and even the regular Mealworm (Tenebrio) will eat a surprising variety of plant-based food stuffs. Try feeding things such as dark green or orange and yellow vegetables, edible weeds such as Malva, Dandelion, Plantain, Chickweed, young Nettles, and many species of tree leaves which are particularly good for calcium and other good minerals. I like Mullberry, Grape, White and Black Alder and Willow for just a few. I do suggest you search for non-toxic species of plants since many insects will eat poisonous greens as a way of creating a defense for themselves and they themselves don't die from this. Usually I have found these defensive chemicals also make the bug taste bad to a predator and I have never experienced a problem from a wild plant fed cricket or worm poisoning a chameleon. Your local library most likely will have a lot of info on what's poisonous and what's not. One item that I especially like to feed to Zophobas ( Giant Mealworms) is rotted or composted Horse Manure! This is a great food and is full of important nutrients. Horses fed on an Alfalfa based hay diet especially have rich manure for feeding to your bugs. After discovering that Zophobas naturally live in caves and eat bat guano, dead bats and other cave creatures, I began to experiment with various food items. I discovered that by far the best and juiciest worms are produced on well-rotted horse manure mixed with wood chips which they also will eat. The manure should be rotted enough that it no longer generates heat when piled and kept moist. This might sound very strange at first since most people think Zophobas are nothing but a giant mealworm but in fact they are not a mealworm at all but a carrion and detritis consuming insect. If you don't happen to have horse manure available then other rich composts will work also. Just avoid any with chicken manure in them. For some reason this contains an ingredient that seems to kill Zophobas. Also beware of horse manure from horses wormed with Ivermectin in the last 30 days. It is hard to believe anyone would get tired of eating crickets, but it does happen! Q. I have inherited my son's Veiled Chameleons since he seems to have lost interest in them. I like the animals but have no idea about caring for them other then the information in the small booklet he got when he bought them from the petshop. I am especially worried about feeding them. Someone told me that I need to give them liquid vitamins every time I feed them a cricket. Is this true? What brand should I use? A. After a lot of experimentation among the more advanced chameleon keepers I think the general consensus is that vitamins are important but should be given in their natural form. Vitamins are just as important as minerals are for chameleons but can be very dangerous if over supplemented. I personally do not give any vitamins other than what the insects that are eaten by the chameleons consume themselves and I don't recommend that you give any bottled vitamins. Most insects know what a great food bee pollen is and eat it readily. The main thing to remember is that bugs need a wide assortment of foods in order to carry natural vitamins and minerals to the animals that eat them. Q. My Senegal Chameleon is shedding it's skin but it's coming off in patches. Isn't it suppose to come off in one piece like a snake's? Help! A. 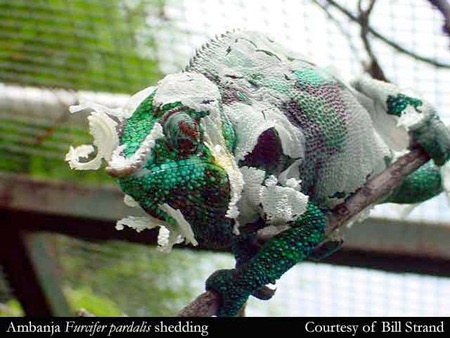 Unlike snakes, chameleons normally shed their skin in patches. The main thing to remember is that all the patches should come off easily leaving a nice smooth and nicely colored skin beneath them. If any patches stick to the underneath skin and do not come off easily it probably means your animal is being kept too dry and needs higher humidity in its environment. 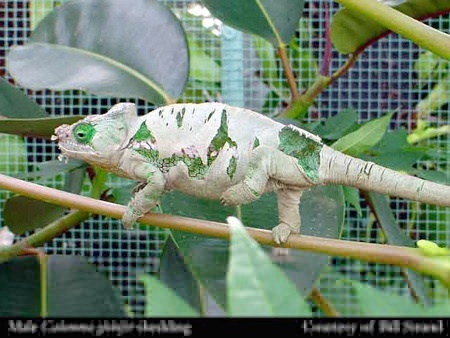 Humidity can be increased by frequent spraying and including natural plants into the chameleon's cage. The moisture from the soil of the live plants inside the cage will also help to increase humidity in the cage.